Pamper sensitive scalps with the KLORANE Conditioner with Peony; a gentle treatment that improves manageability and enhances shine without causing irritation. Suitable for daily use, the mild formula envelopes each hair follicle with moisture and nutrients without disrupting natural pH levels. The addition of Peony Flower extract, scientifically proven to have high levels of anti-irritant molecules, helps to instantly soothe soreness and alleviate discomfort. Hair feels replenished and easier to style, with a comfortable scalp and healthy looking shine. Free from silicone, parabens, sodium chloride and SLS. After using the Shampoo with Peony, remove excess water and apply conditioner in sections. Comb through; leave on for 2 minutes and then rinse. KLORANE Conditioner with Peony 1.6 fl.oz. 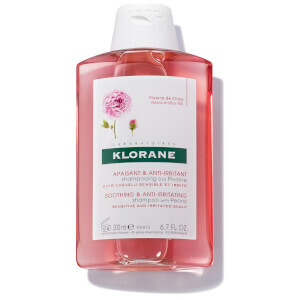 KLORANE Shampoo with Peony 6.7 fl.oz.